Iceland, Iceland – who else is obsessed with that little lava-rock country? OPI, that's who! Greetings friends!! Let’s take a trip! Let’s take it to Iceland! It&apos;s no-night summer there right now, with temps that can hit about 25°C – and drop to 10°C, so you should bring a sweater. 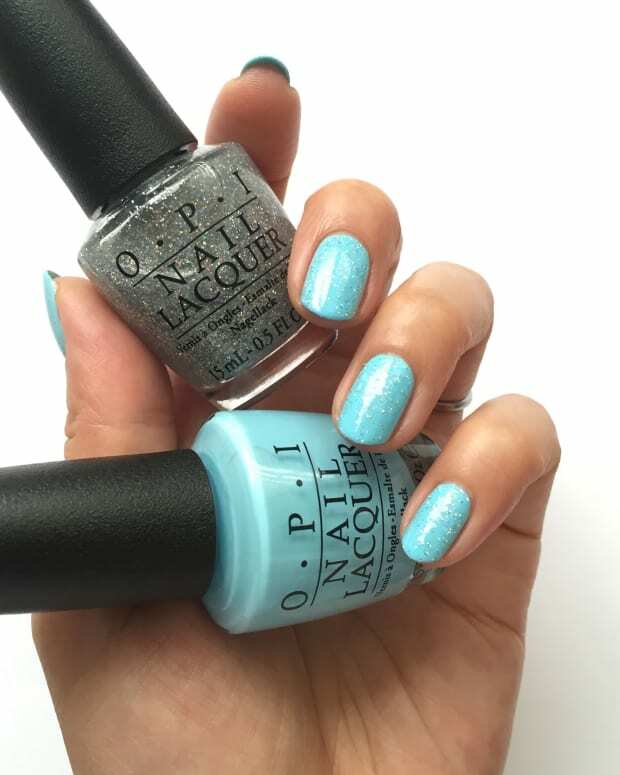 Or, we can be armchair travellers with OPI, no passport necessary! 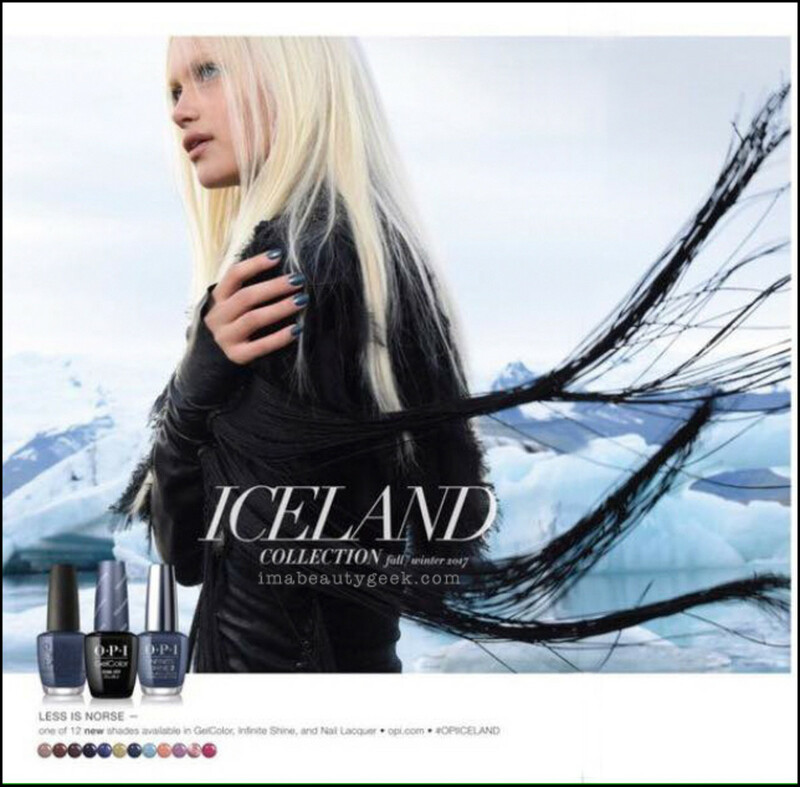 All 12 OPI Iceland Collection FW 2017 shades available in GelColor, Infinite Shine, and OPI Lacquer? Amazing! But you know I only have the regular lacquer shades to share today, right? Because that’s what I bought from SparkleCanada.com as soon as they were available! Wanna see ‘em? Yeah, I know you do! 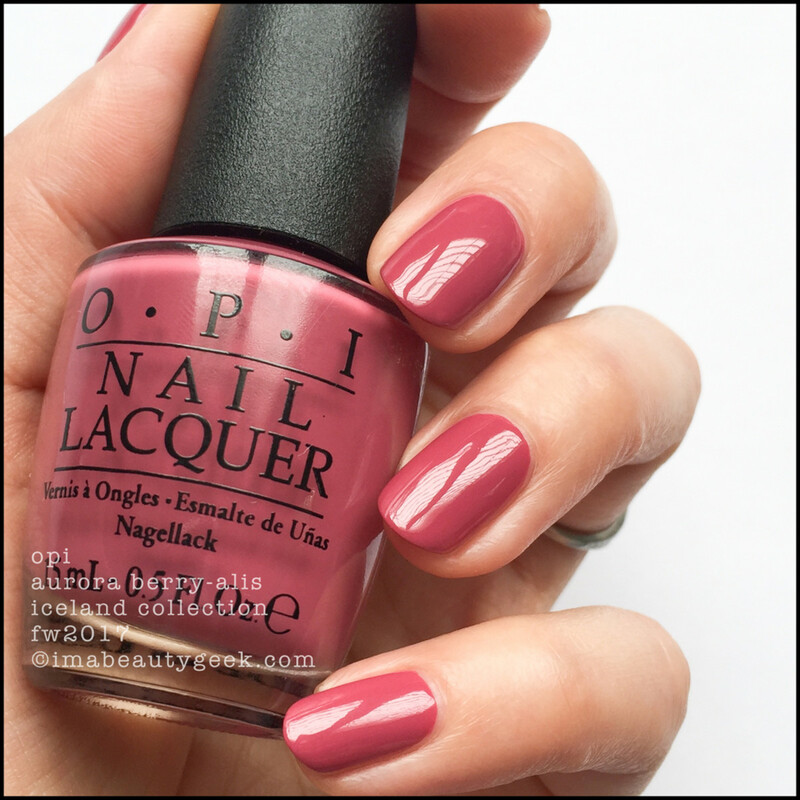 OPI Aurora Berry-alis – OPI Iceland 2017 (above). Running out the door for an evening function, you could totally slap on a single coat and get away with it. It’s better with 2 though. And this formula? It’s beautiful. I like the colour too. It seems oddly out of place in this collection but the dusty tone fairly tugs at Nick’s wallet. 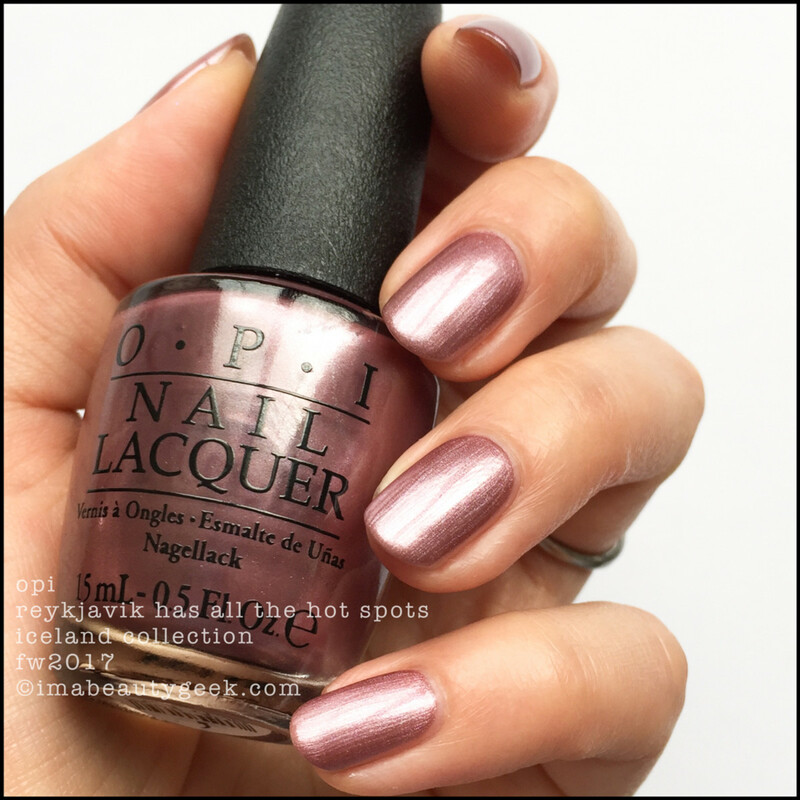 OPI Reykjavik Has All The Hot Spots – OPI Iceland 2017 (above). Unnhhhh! Lookit dat! Sure it’s 3 coats but don’t forget my coats are probably ½ as thin as most. I didn’t really neeeed to do 3 but to minimize streaks and get this perfect finish, it was called for. I just do what the polish tells me to do, really. And unnhhhh… lookit dat! #GrabbyHands. 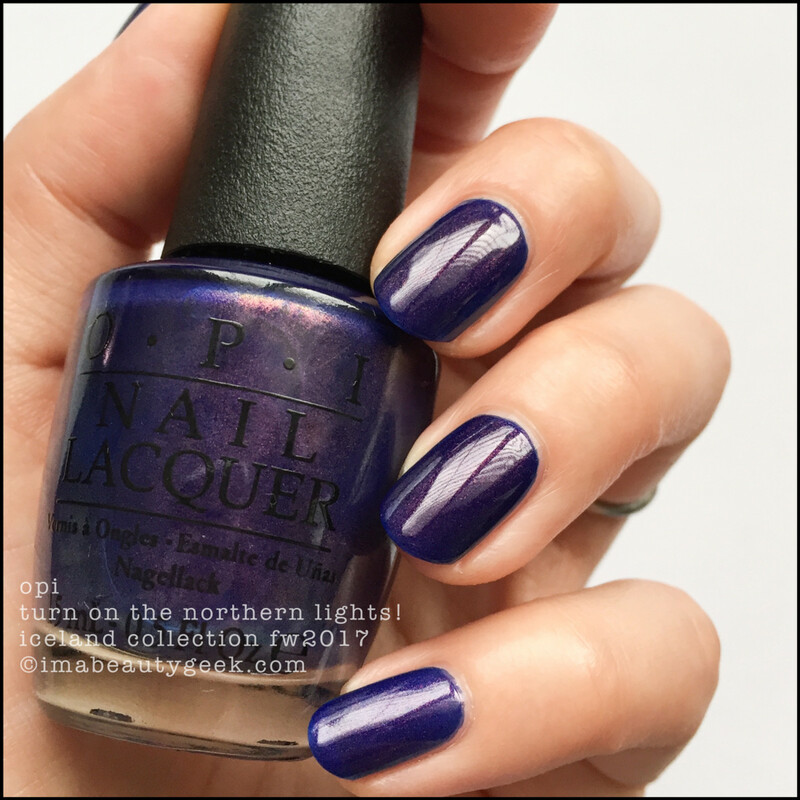 OPI Icelanded a Bottle of OPI – OPI Iceland 2017 (above). 2 coats. What? 2 coats. Really? Yes, 2 coats. This is one heckuva stunning formula. Of late, OPI hasn’t been making formulas that are easy for me to use, but if they start making everything like this again, they&apos;ll easily rekindle my OPI love. 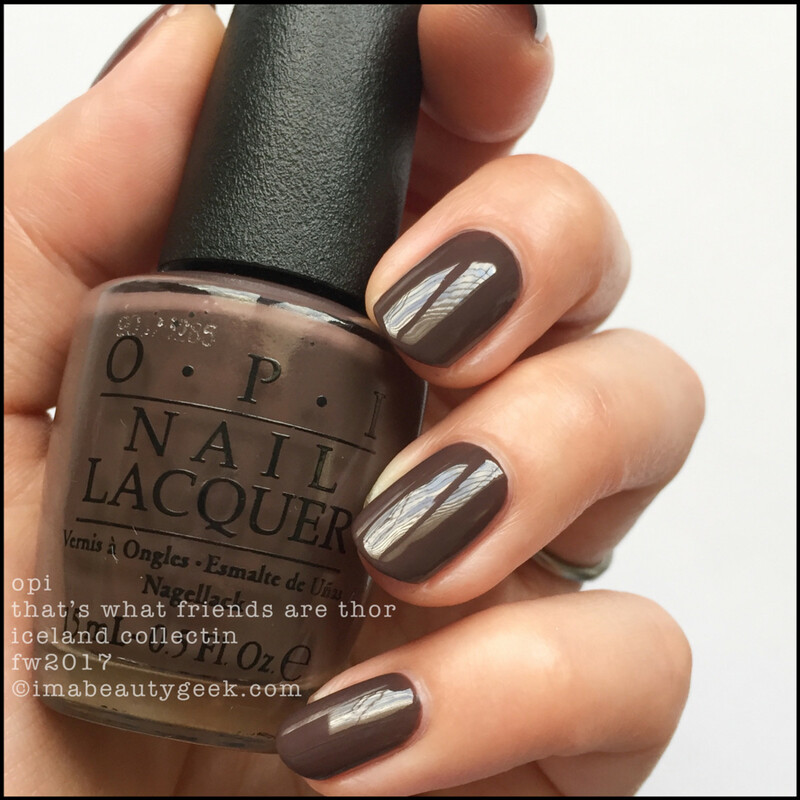 OPI That’s What Friends Are Thor – OPI Iceland 2017 (above). Wow. That dries a lot darker than the bottle, huh? I don’t care though because… 2 coats! 2! Whaat? These formulas! 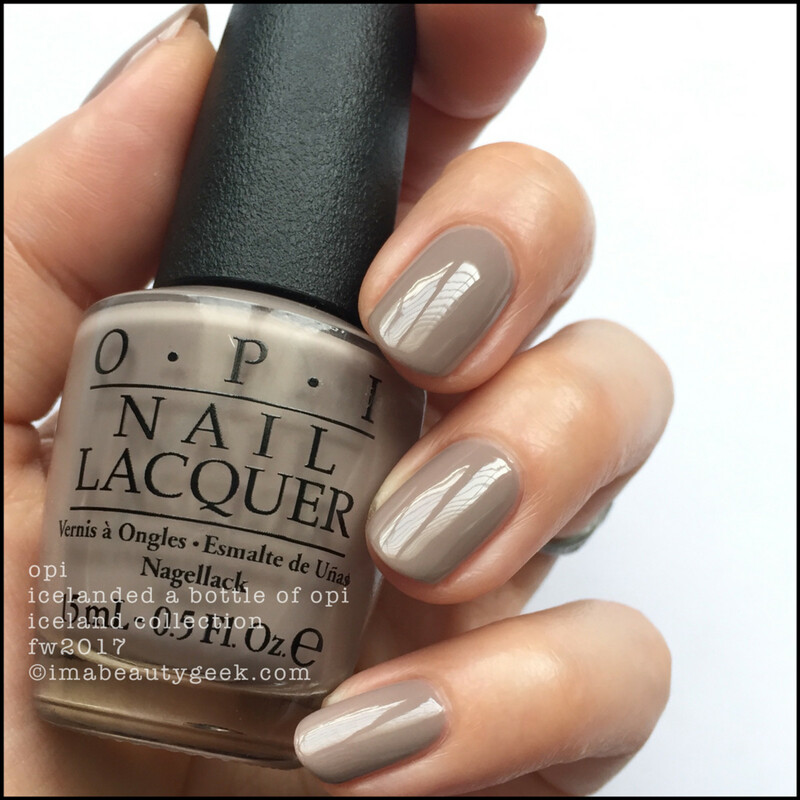 Where have you been, OPI? I’ve missed you! Welcome back! 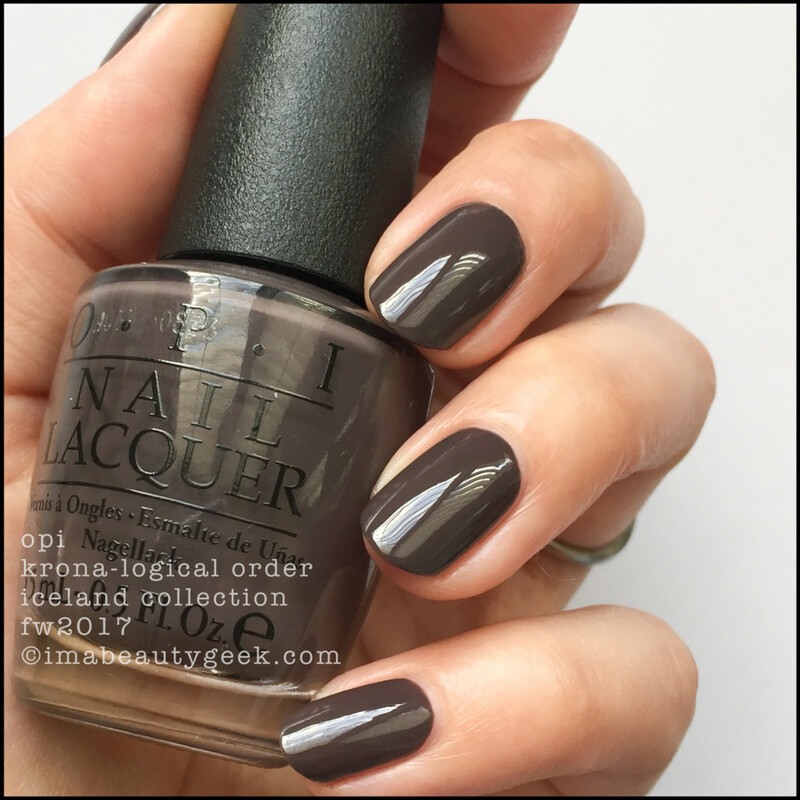 OPI Krona-logical Order – OPI Iceland 2017 (above). Yes, it’s another brown, but hey, if you haven’t heard, Suzi says “black is the new black.” What does that even mean? It means shades that have a bunch of black in ‘em are trending for the Fall/Winter 2017 season. This shade? Beautiful. The formula is a wee bit thinner than That’s What Friends Are Thor, but it’s still just 2 coats to this more mauve-y shade of espresso. Do I like? Yes. I like. 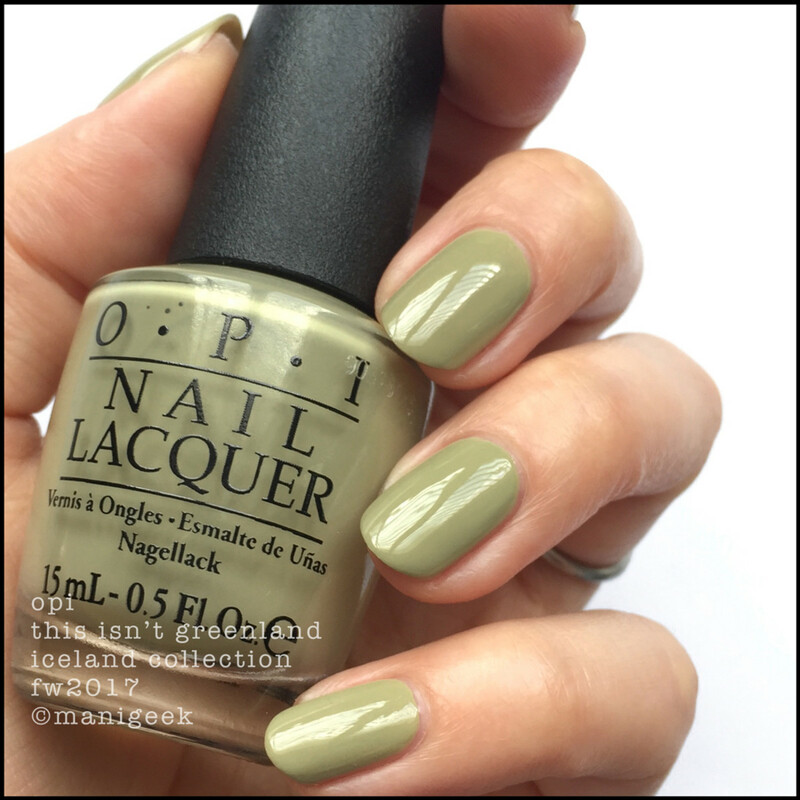 OPI This Isn’t Greenland – OPI Iceland 2017 (above). Surprise! Pastel pistachio green! It takes a little getting used to, but after looking at it for about 30 seconds, I think this is a brilliant shade for Fall. I did have to do 3 coats to get it perfect, but for a shade that’s not-so-common, I’m down with that. OPI One Heckla of a Color! – OPI Iceland 2017 (above). My notes here say “super formula heart heart heart. Dries darker & is hard to catch perfectly but this is close – just a little more dusty grape.” Why so hard to catch in photos, Manigeek? I don’t know. I tried though. You know I did. Besides, it says “heart heart heart” – that’s all you really need to know, ain’t it? Hahahahaaaa!! Get shoppin’! 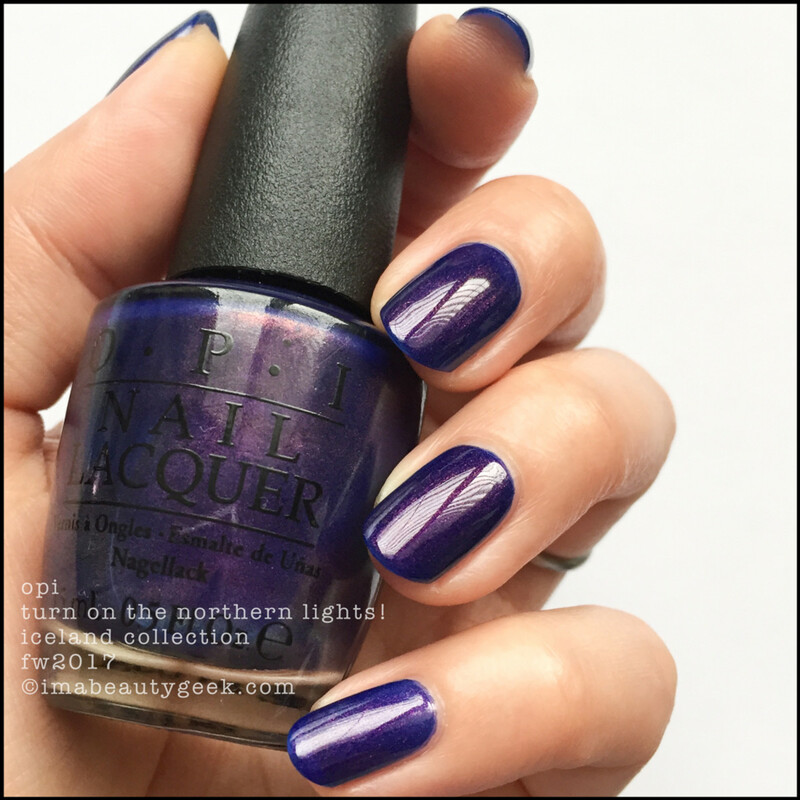 OPI Check Out The Old Geysirs – OPI Iceland 2017 (above). That’s 2 coats, but I think my bottle could probably have used a drop of thinner. It did level though, and that shine from the shimmer is pretty swell, but I’m not sure I absolutely love the shade on me. Does it conjure up Iceland? You betcha! 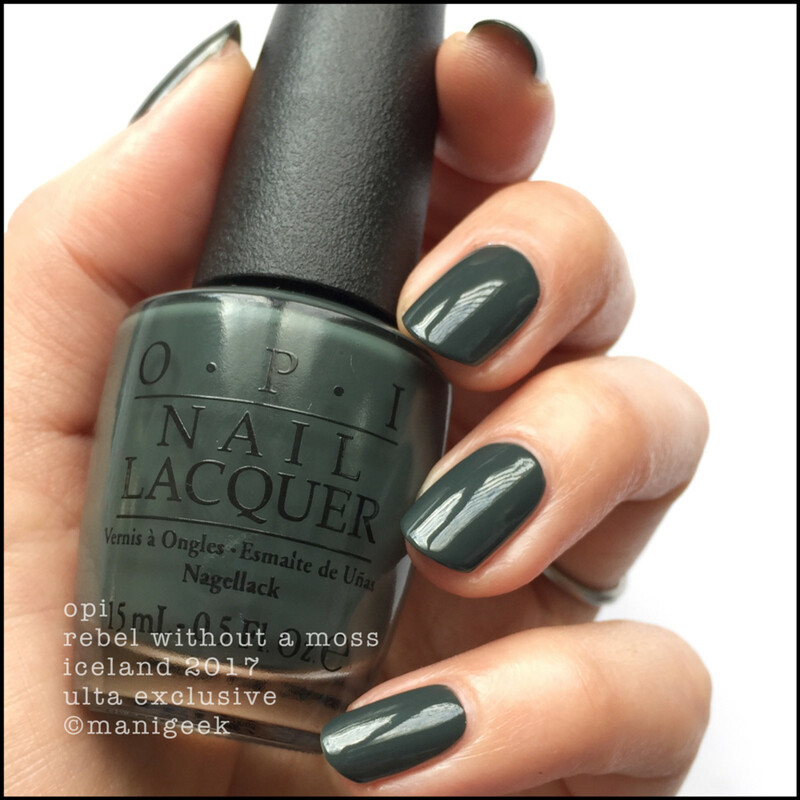 OPI Less is Norse – OPI Iceland 2017 (above). 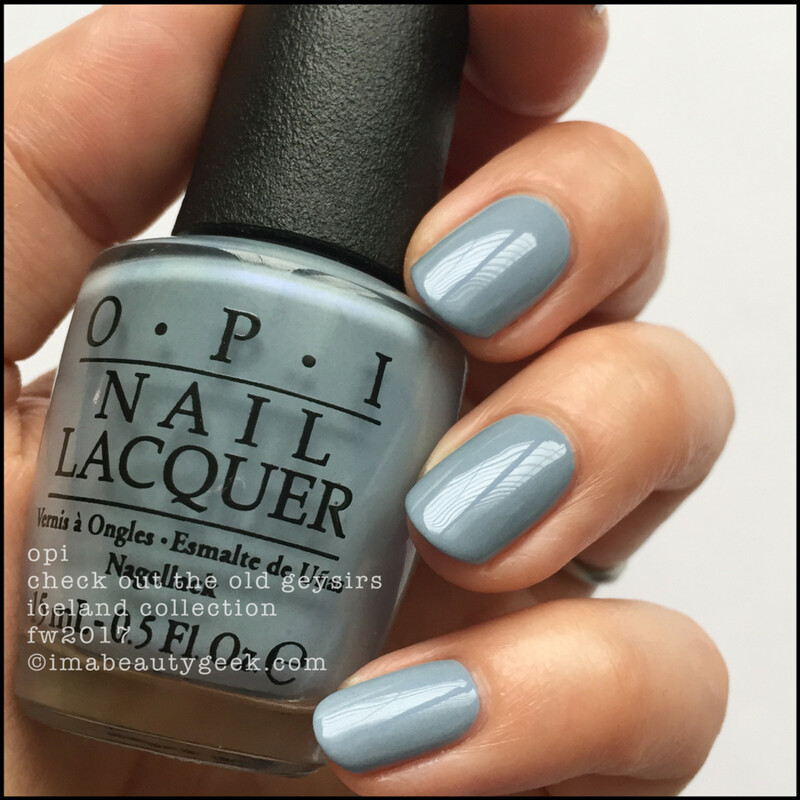 OPI is calling this their “Hero Shade”. What’s a “hero shade,” you ask? Well, it’s the shade they want you to focus on. And you know what? There’s nothing I can tell you about this shade that you can’t see from this photo. Nothing. I mean really, that right there is OPI perfection. Absolutely. Unquestionably. One jillion percent. 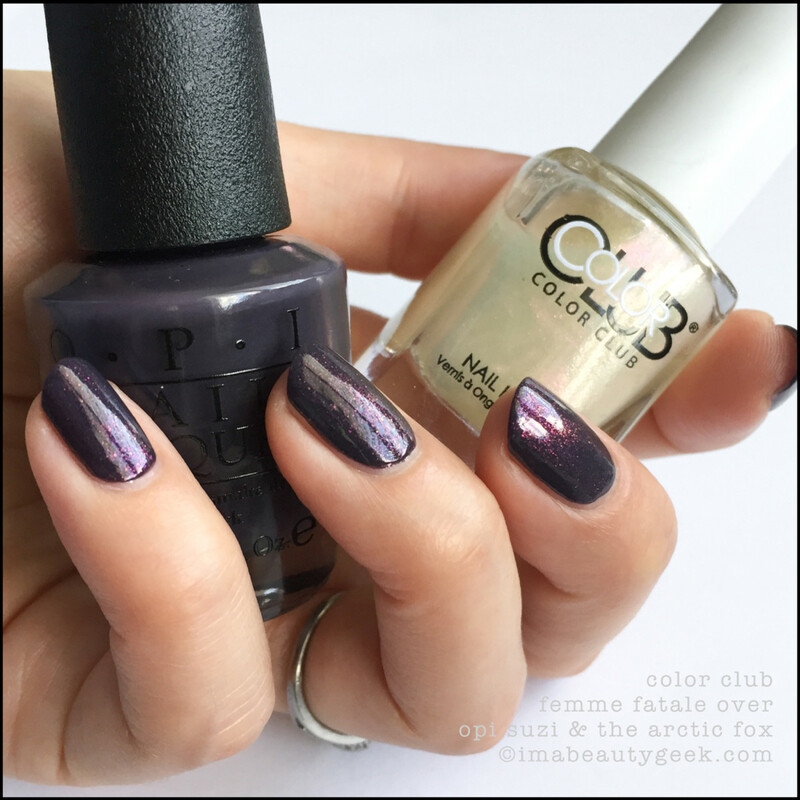 OPI Suzi & The Arctic Fox – OPI Iceland 2017 (above). 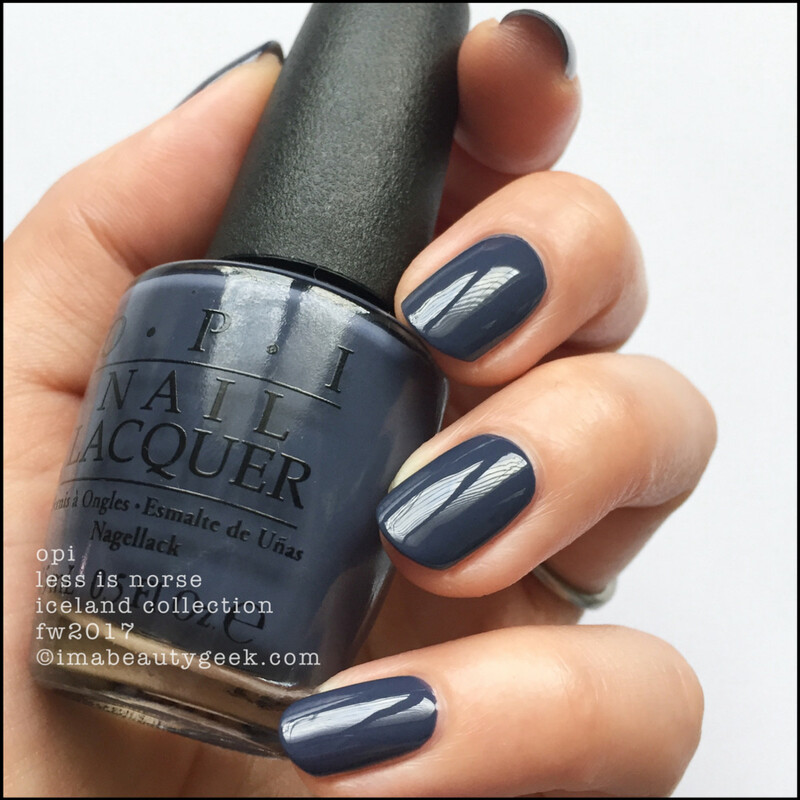 2 coats to this dustastical navy purple. Dear OPI, it’s so good. Thank you. 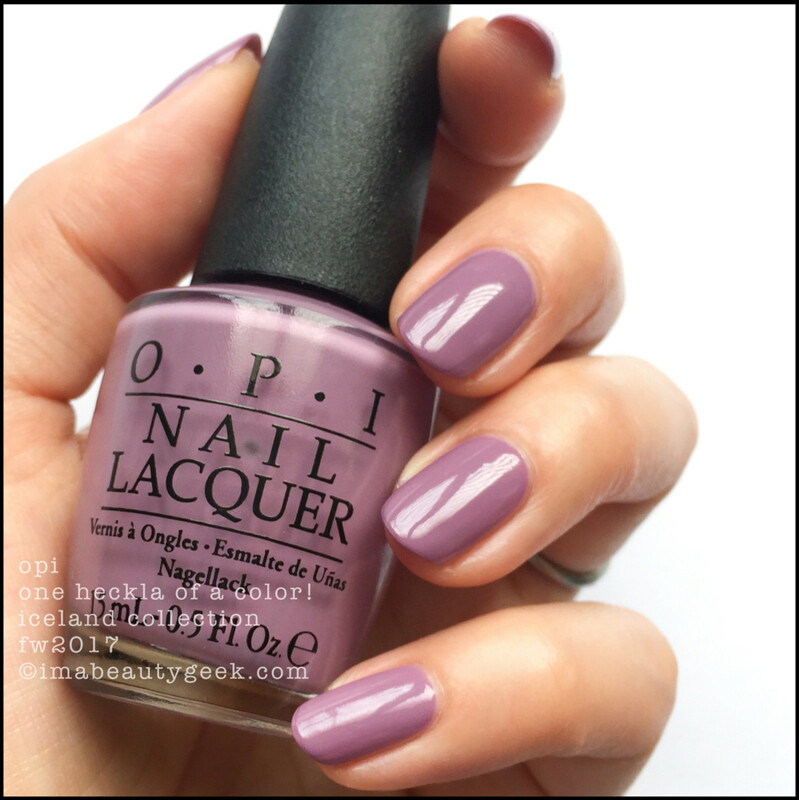 OPI Suzi & The Arctic Fox w/ Color Club Femme Fatale Top Coat (above). I know you’re thinking that Suzi & das Fox was already pretty swell, but this topper was on my desk. When stuff is on my desk, things happen. It’s kinda great, ain’t it? OPI Turn On The Northern Lights! – OPI Iceland 2017 (above). It’s 2 coats, it’s good, and it’s interesting. I thought it was going to be blue, and on the first coat it was. Then, on the 2nd coat I got this indigo purple with pink shimmer. It’s lovely. OPI Turn on the Northern Lights! w Top Coat (above). If you add a coat of top, the shimmer really pops out and adds serious depth and serious magic. 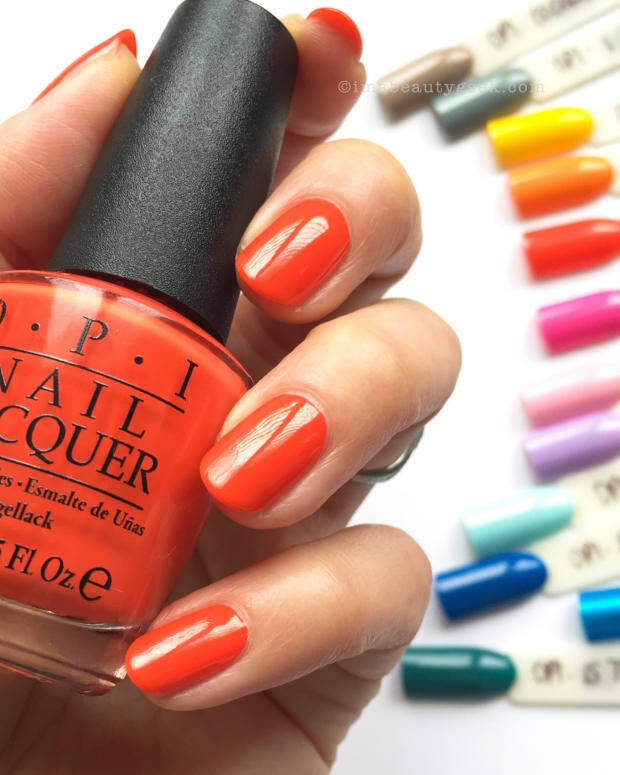 For OPI and their heavy focus on standard crèmes, this is absolutely a step in the right direction. And that’s all she wrote! 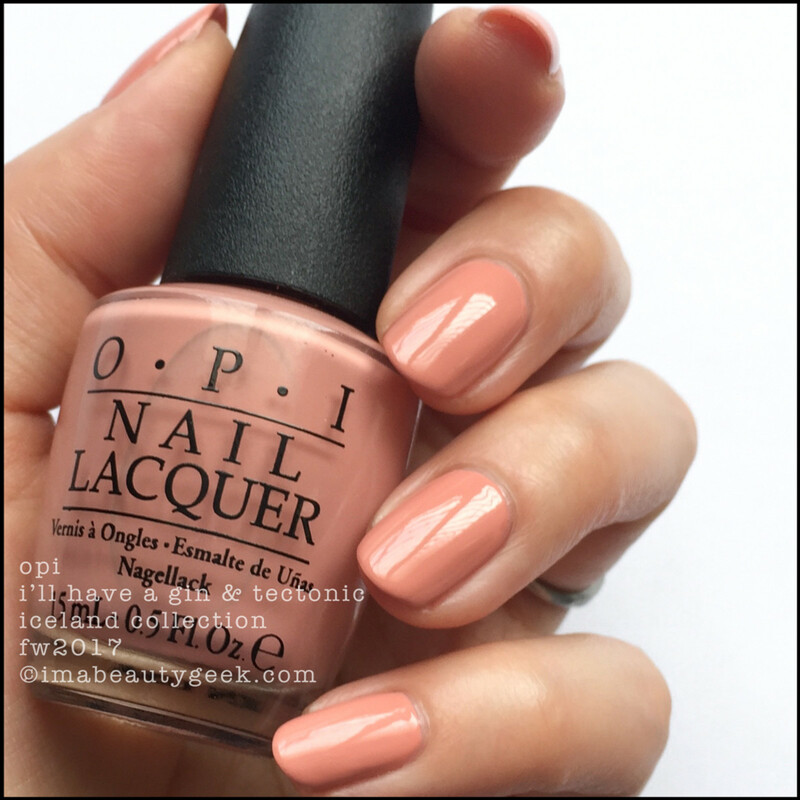 I think if you’ve been hangin’ with me here for other OPI things, you’ve seen that I’ve become somewhat disillusioned by their recent offerings. If it hasn’t been the complete boredom, it’s been issues with formulas. This collection wipes a lot of that away and even though I can’t say it’s an entirely cohesive collection, It’s on target for Fall. There are some things in here that I haven’t seen done as well as this in a long, long time. 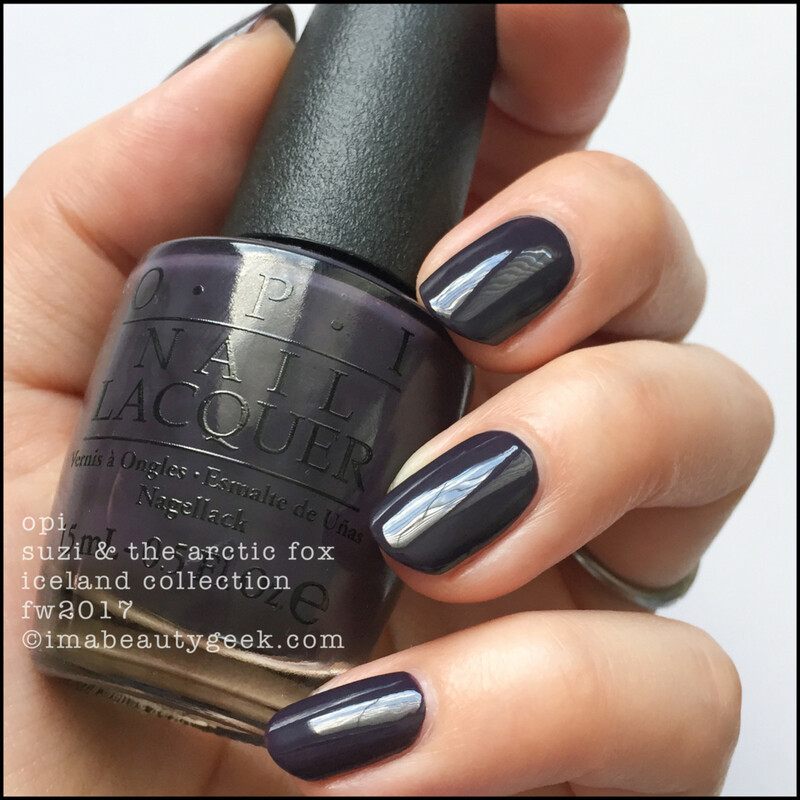 Iceland 2017 Fall/Winter made me happy – an OPI collection hasn’t done that since… golly, I don’t remember when. Availability: Right! Lemme tell you again where I got mine! It’s from SparkleCanada.com and is in stock right, right now. I don’t know what the actual release date is but I’ve heard rumours it’s available from a bunch of online places south of the border. 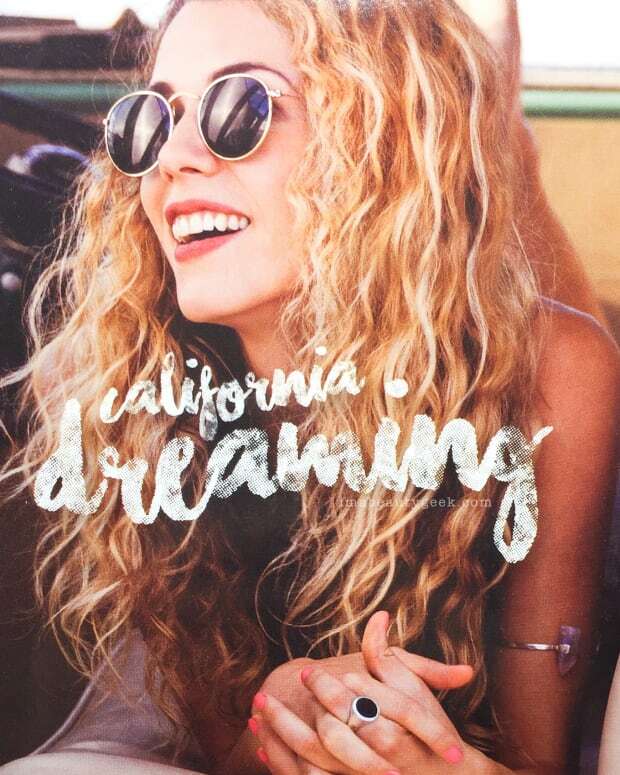 In a little while I’m sure you’ll be able to get it at ulta.com, amazon.com, and probably amazon.ca too. Oh yeah, and watch for prices to have gone up. If it hasn&apos;t happened yet, it&apos;s happening soon. *insert sad face here*. Can we talk about the collection now? 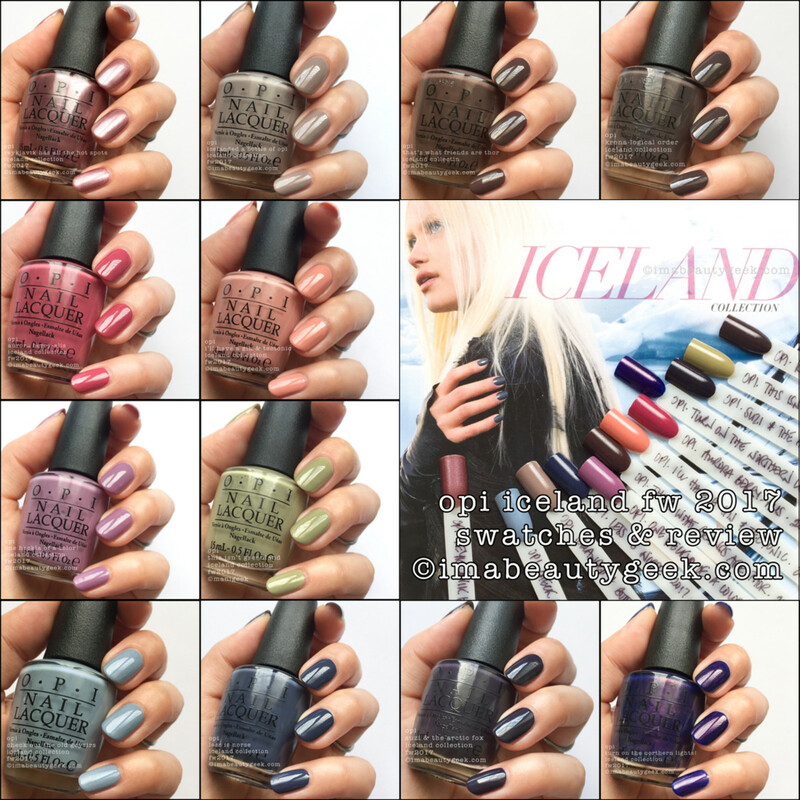 Can we talk about how the above OPI Iceland promo shot isn&apos;t even close? Can we? Can we? Huh? Or can we just talk about your thoughts on the shades I showed you? Yeah! Let&apos;s do that! Oooh! Score! I got a special #NailMail delivery of one of the three Iceland Ulta exclusives! It&apos;s OPI Rebel Without a Moss (above) and it&apos;s 2 easy coats to perfect. Oh, and if you&apos;re dreaming of really taking a trip to Iceland, check out J&apos;s post about her visit via Wow Air.